In the Fall of 2014, Borough Council appointed an Aging-in_place Task Force to make recommendations to Council on how to make Swarthmore more age-friendly so that those who wanted to age in place could do so. The Task Force presented its recommendations to Council in December 2015. Council is reviewing the recommendations requiring its action and several members of the Task Force are working on implementing the other recommendations. 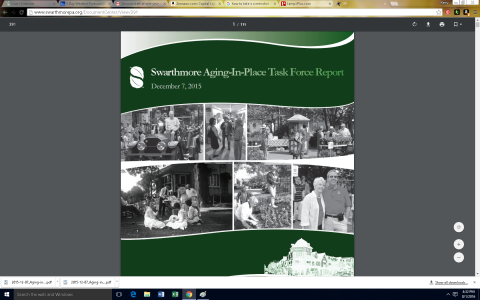 One of the recommendations was that Swarthmore apply to WHO for designation as an age-friendly community and to continue to work to achieve this for at least the next three years.